As I reported last winter (2010 President's Report), we now have the equipment needed to begin making digital copies of most of the obsolete analog videotapes in the Arthur Hall Collection, a first step in creating a digital archive. We also have a digital editing program that allows us to edit, correct contrast and color, filter sound, burn to DVD, and, for those with high speed internet, upload short clips for posting on our website. Northeast Historic Film continues to make digital masters for the collection from large format videotapes and from motion picture films, most recently a digital copy of Fat Tuesday and all that jazz! from the analog preservation masters made from the tapes provided to the collection by Wesley O. Brustad and a digital copy of Ile Ife House of Love from the 16mm print provided to the collection by Ray Hartung. Already we have remastered House of Love and burnt a series of proof DVDs which have been sent to alumni who appear in the film and to others interested in our work. Fat Tuesday is about 95% remastered. The digital copy has frequent dropped frames and other digital anomalies which require tedious frame-by-frame manipulation to correct. We are working with Wes Brustad, the producer and co-writer with Arthur and Allan Jaffe, to edit the original PBS broadcast, removing the narration to allow the concert to play on its own. We are collaborating with Benjamin Jaffe of Preservation Hall in New Orleans to make a short film with credits for individual performers, an overview of the history of Fat Tuesday, and a scroll In Memoriam of those who have passed on. Proof copies of this work have been burnt to DVD and mailed to those involved. When complete, we hope to publish a DVD of Fat Tuesday with any proceeds going to support our nonprofit preservation efforts and Ben Jaffe's nonprofit music education efforts in New Orleans. A children's class in the William Penn High School gym, July 15, 1993, with warm-ups and across-floor practice of a New Orleans Second Line dance, James Corry on drum. 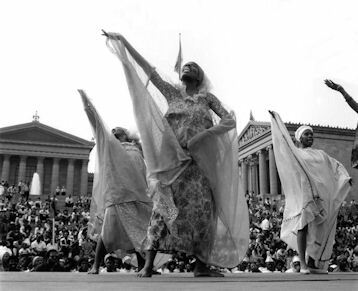 The July 16, 1993, reception in City Hall of Philadelphia for Arthur Hall Appreciation Day, including speeches, proclamations, drumming, Rufus Harley on bagpipe, Kofi Gyemoriah stilt dancing, and Senegalese dances. The July 16, 1993, reception and dinner at the Pennsylvania Academy of Fine Arts, including speeches by Bob Rutman and Joan Myers Brown, among others, Arthur's address, "The Significance of African and African American Arts and Culture," drumming by Daryl Kwasi Burgee, Steve Jackson, et al, and impromptu dancing by Arthur, Scuddy McGee, Evangeline Brown, Kofi Asante, Rita Cottman-Johnson, and others. 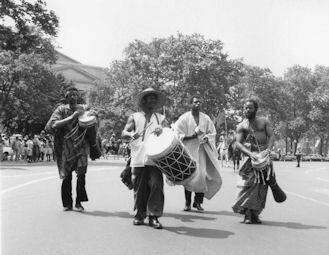 Arthur's return to the Ile Ife Center on July 17, 1993, including the pouring of libations, a reunion with Ione Nash, and a tour of the Village of the Arts, followed by a procession down Broad Street with Jomo Amen-Ra and Lawrence Clark drumming, Rufus Harley piping, and Kofi Gyemoriah stilt dancing, followed by performances on the William Penn High School's outdoor stage for MARC Fest'93, including Philadanco and, from the Afro-American Dance Ensemble, performances by Van Williams, Khalilah Allen, Rita Cottman-Johnson, Jerome Williams, Kofi Asante, and others. Arthur's master class on July 18, 1993, at Movement Theatre International (MTI), including Dunham technique and across-floor exercises breaking down elements of Yanvallu. The Reunion Performance Concert on July 19, 1993, at MTI including performances by several cultural groups, Ode to Yemanja, a triumphant Obatala, and an impromptu finale by Ione Nash. From these first digitized images I cut together a short piece on Arthur's children's class and a short sampling of the whole series of tapes, reducing 14 hours to a few minutes, for posting on YouTube and embedding on our website. Much work remains to be done just on these files, including entering their detailed metadata into a searchable program, determining the proper standards for making duplicate "Preservation Masters," editing raw camera tapes into more accessible "Marquee Masters," and arranging for their long-term preservation, accessibility, and broad distribution. To those ends we have prepared a grant application to the National Endowment for the Humanities and are discussing long-term agreements with the Free Library of Philadelphia and the Philadelphia Dance Collection in the Special Collections of the Temple University Libraries to find a permanent home for the digital archive of the Arthur Hall Collection as it is being created. At the end of this work, all original materials will be properly stored in climate-controlled archives, the digital archive will be fully documented and searchable by anyone anywhere in the world with an internet connection, and the Arthur Hall Collection will be freely accessible to scholars and the public for research, education, and public programming. Last month, I traveled to Philadelphia for the June 10 and 11 celebrations surrounding the unveiling of Arthur's historic marker at 2544 Germantown Avenue. I documented the events with both a still camera and a new 16:9 motion picture camera. The collection, therefore, now contains footage that was "born digital." 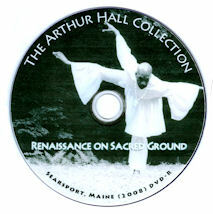 A quick editing is posted online, linked to our homepage, and is included in the proof copies of Ile Ife House of Love: Nine short films from the Arthur Hall Collection, which includes the new and improved Renaissance on Sacred Ground (2011, 15:00 minutes). If you would like to see a proof copy of this DVD, please contact me. So far in 2011, we have received over $2,900 in cash contributions. Since beginning the Renaissance project in August 2008, we have received over $13,000. A combined financial statement is posted online at www.ileife.org/3m2p/DAPsummary.html and is updated quarterly, most recently on July 30. Our new Honor Roll of Donors and Contributors is updated as donations are received, most recently adding donationas from Barbara Kinney, James Crawford, and Jerome Williams. If you have any questions, comments, or corrections, please contact me directly via email at bruce.williams@ileife.org or by using our online form or by phone at (207) 495-2617 or by mail at the address below.